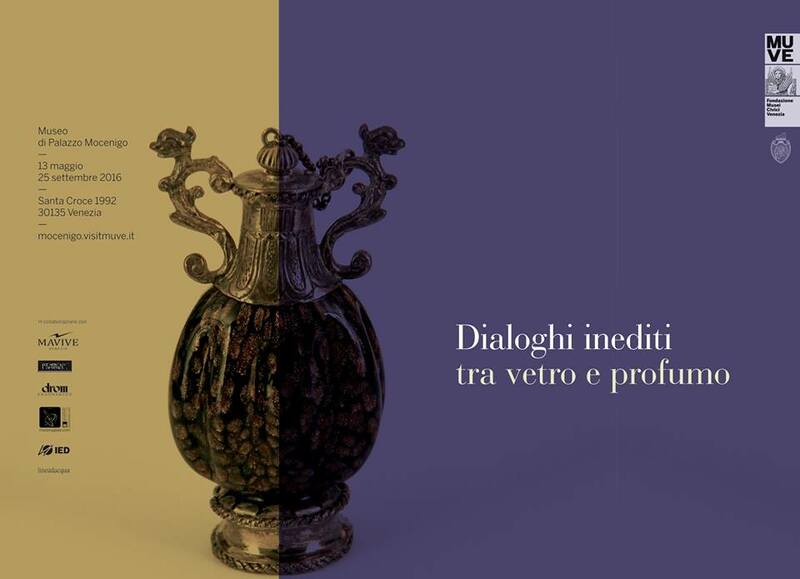 Consorzio Promovetro, in collaboration with Fondazione Musei Civici di Venezia, IED (European Institute of Design) and Mavive has realized the exhibition New Dialogues Between Glass and Perfume which will be held from 13th of May to 25th of September 2016 at Palazzo Mocenigo Museum. A fascinating exhibition that tells the ancient relationship that has combined the artistic excellence of Murano glass, with the perfume in Venice for centuries, and that shows the different and interesting artistic paths which have accompanied these scents since the past up to the present. Those dialogues between glass and perfume continue today, thanks to the exclusive fragrances specially created by Mavive, unpublished creations of young designers from the European Institute of Design, and the interpretation of the glass masters from the concessionaires companies of the Vetro Artistico® Murano trademark. Twelve unpublished perfume bottles will be exposed to show how Murano Glass is still a suitable material to tell the emotions of a fragrance and its evocative powers. At the end of the exhibition the works will be auctioned, and the funds will be donated to the Museum. The Companies bearer of the Vetro Artistico® Murano trademark which collaborated to the exhibition are: Alessandro Mandruzzato, Pino Signoretto, Simone Cenedese, Nicola Moretti, Costantini Glass Beads, SAS Di Pi, Gambaro e Tagliapietra – Murano Glass Studio.